(Trichosanthes cucumerina) Also called Snake Gourd. Unusual and delicious gourd relative that is referred to and used as a bean in its native China. Its fruit tastes much like green beans, except even more delicious and tender. 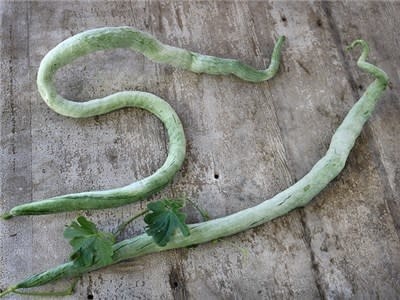 We could give up a lot of other vegetables before we would not grow this queen of garden crops, known for its divine taste and snake-like beauty. So snake-like, in fact, that the beans terrify more than a few visitors to our garden each summer! Snake bean is almost completely absent in U.S. markets. Its long, delicate fruit doesn’t ship easily. 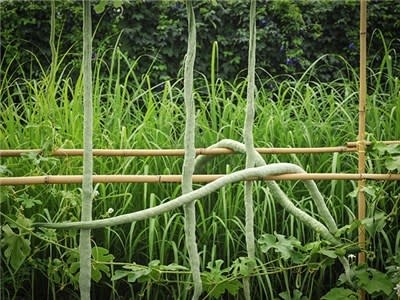 Chinese Green Python snake bean is the largest snake bean variety, growing up to 60 inches long and 1.5 inches thick! As it matures, it develops bright green color and a thin layer of wax on the skin. When harvested at 12- 30 inches long, it can be used like green beans or summer squash. Traditionally stir fried with peppers and onions, this vegetable has many culinary uses. In Africa the inside of fully mature fruit can be scraped out and used like tomato paste. This variety will need a sturdy trellis; pinching lateral branches under 30 inches will encourage climbing. Fun to grow in kids’ gardens, an absolutely unique new vegetable!